Dental crowns are one of the most commonly used restorative dentistry solutions. Crowns are crafted to fit completely over the top of damaged teeth. They can be crafted from a number of materials including gold, porcelain bonded to metal, and all-ceramic depending on patients’ needs and goals. If we recommend dental crowns, patients should plan to visit Pleasant Grove Family Dentistry at least two times. If you would like to find out more about dental crowns at our Texarkana dentistry office, contact us today. 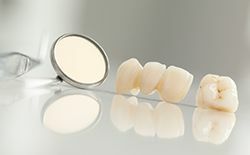 We offer dental crowns crafted from three materials, and each has its own unique advantages and disadvantages. Gold is the most durable material, and it is often used for back teeth that absorb more shock during daily wear and tear. However, it is the least cosmetically appealing solution, so patients who have damaged front teeth may prefer one of the other materials. Porcelain bonded to metal offers improved appearance with the strength of a metal restoration. Over time, the porcelain may wear away revealing the darker colored metal below. 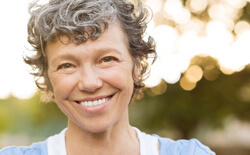 For the most cosmetic solution, patients should consider all-ceramic crowns. These crowns maintain their natural appearance even after years of wear. During an initial appointment at our office, Dr. Marracino will prepare the tooth to receive the crown by removing any damaged or decayed structure. 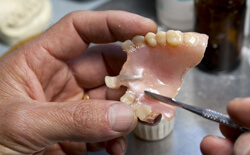 Then, we’ll capture bite impressions that are used by the dental lab to craft the custom crown. Before patients leave, we apply a temporary crown to protect the prepared tooth. When we receive the final crown, patients return to our office to exchange their temporary for custom dental crown.